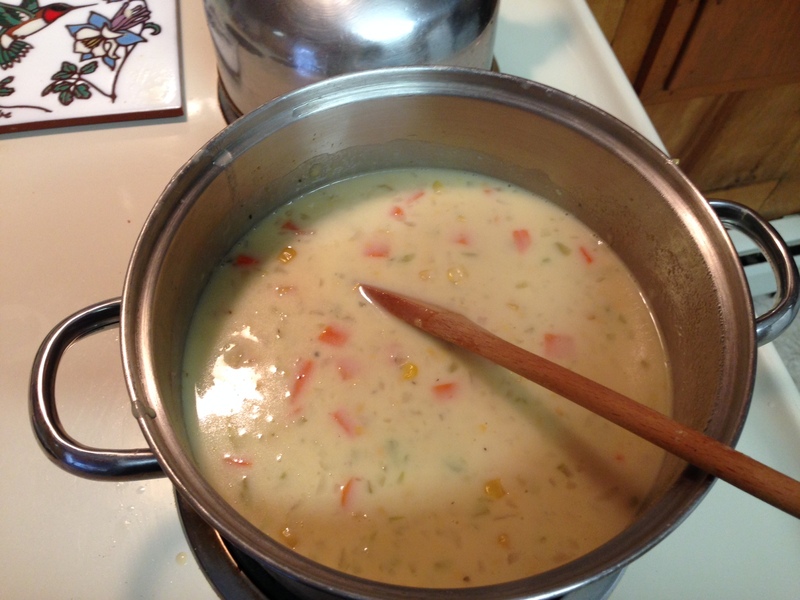 This is THE BEST corn chowder. We had it for the first time many years ago at one of my Halloween parties. Linda brought it in a crock pot. It was a hit and was gobbled up quickly. My sister Jackie and I made it tonight over at the folks’ house for supper! Hmmmm Hmmmm Good! No leftovers tonight either! My mom made some biscuits to go with the chowder. In a large pot cook potatoes, onion, carrots, celery, salt, pepper, and thyme in boiling water (about 20 minutes). DO NOT DRAIN LIQUID. Add cheddar cheese and cream style corn to pot and stir well. Meanwhile, make white sauce by making a roux with margarine and flour in a small sauce pan. Add all the milk at once while stirring constantly. Cook until the sauce thickens. Add white sauce to above mixture slowly while stirring. Simmer to heat through. Do not boil. You can use evaporated skim milk instead of regular milk. It makes the white sauce even thicker. (We used evaporated skim milk tonight.) Try substituting sweet potatoes for white potatoes and red pepper instead of celery. This is my cousin Linda’s recipe. It really is the best corn chowder.